I found this old blog post in my drafts folder. It is the original blog post I wrote about KCB from back in 2011 – when I will still working in museums and hadn’t bought the yarn shop yet. Does anyone else drop stuff in their drafts folder and never get back to them? I have 69 drafts just waiting to be published!!!! I have probably already posted some of this information but I really like this post and wanted to share it. 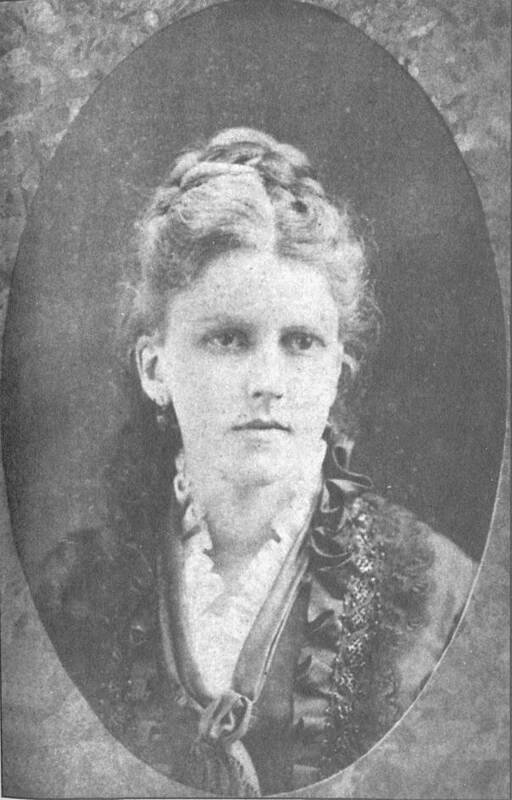 Katherine Breckinridge at age 22. Katherine Carson Breckinridge was born Katherine Breckinridge Carson on February 20, 1853 on her father’s plantation in northeastern Louisiana. She was the daughter of Southern planter privilege and this would be her legacy to her children. My research on Breckinridge was varied and wide reaching because she didn’t exist in a vacuum. Her world, her experiences, her family all influenced the woman she became. The part of the process that I dreaded the most but found the most satisfying was doing her genealogy. Unlike the Ancestry.com commercials lead you to believe, genealogy is hard work and very time consuming. And genealogy is not just about clicking on a leaf. Names, dates and places are important in history but these things are only a small part of a much bigger story. You have to figure who these people in the family tree are and what they were like. For instance, I knew that Katherine Breckinridge Carson was the daughter of Dr. James Green(e) Carson and Catherine Waller Carson but I didn’t know anything about them. What were their politics, their religious views, their thoughts on slavery, and their constitutions? All these questions are important for historians to ask. As an aside – historians are supposed to be as unbias and objective about their subjects as possible. It is also important to be an observer of your subject and not interact with your subject. Historians are not novelists and I will admit that at times it was very difficult not to give Katherine Breckinridge traits and characteristics that I wanted her to have or needed her to have in order to make the “story” better. Yes, I know she is dead but when you are spending the majority of your time consumed by the life of another person, it is hard not to “talk” to them. After some looking in online resources and library databases, I was able to locate some information about Katherine’s parents. The information below came from the following primary source materials. Katherine’s grandfather, Joseph Carson, immigrated to Washington County, Alabama in 1801, and established himself as an attorney and landowner. He married Caroline C. Green of Natchez, Mississippi in 1814 and they had one son, James Green Carson (Katherine’s father), on March 8, 1815. Joseph Carson died in 1818 and Caroline Green Carson died when James Green Carson was about seven or eight years old. After his mother’s death, James Green Carson, moved to Natchez, Mississippi to live with his maternal uncle, Judge James Green. Before James Carson reached adulthood, Judge Green died and left his nephew in the care of a family friend, James Railey, a wealthy Mississippi planter. With his inheritance from his father and his maternal uncle, Carson availed himself of the opportunities wealth provided him and went to boarding school in Connecticut. He attended the University of Virginia before transferring to Centre College in Kentucky to be closer to his fiance, Catherine Breckinridge Waller. James Green Carson married Catherine Waller of Fox Gap, Franklin County, Kentucky, on July 28, 1835. Shortly after the wedding, the couple moved to Canebrake Plantation in Adams County, Mississippi (near Natchez). The Carsons owned sixty slaves who worked as house servants and field hands on the large plantation. James Green and Catherine Waller Carson had five children (who lived to adulthood) between 1843 and 1853: Joseph (born October 19, 1843), William Waller (born June 2, 1845), James Green (born March 25, 1847), Edward Lees (born August 12, 1848), and Katherine Breckinridge (born February 20, 1853). By 1850, Carson owned extensive amounts of cotton plantation land in southwestern Mississippi and northeastern Louisiana. Plantation records list James Green Carson as the owner of three large plantations: Airlie Plantation in Carroll Parish, Louisiana; Canebrake Plantation in Adams County, Mississippi and Concordia Parish, Louisiana; and Oasis Plantation in southwestern Mississippi. I would say that the four paragraphs above took me months to compile. In writing history, research takes you down a lot of different paths. Some are dead ends and some are just wrong for that topics but all are interesting and educational. The above was compile from the following sources. Handwritten note, Carson Family Genealogy, Container 843, Family Papers; “The Family of Thomas Carson, Sr.,” edited by Alan Carson, http://alcarson.home.texas.net/Tom_Sr_Family.htm. John Q. Anderson, “Dr. James Green Carson, Ante-Bellum Planter of Mississippi and Louisiana,” Journal of Mississippi History 18 (October 1956). Breckinridge Family Papers, Manuscript Reading Room, Library of Congress. I’m lucky because KCB did a lot of genealogy, especially for her Daughters of the American Revolution applications. Bits and pieces of information are tucked in archives and special collections all over the country. You never know where a little primary source gem might be hiding. Luckily most of Katherine and Clifton’s papers are part of the Breckinridge Family Papers at the Library of Congress. But that can be one side of the story – literally! In most cases, the letters at the Library of Congress are just one side of the correspondence. And interestingly enough, they are KCB’s side. They are the letters she wrote to other people. So where are the letters they wrote to her? Her eldest son, James Carson Breckinridge’s papers are at the Marine Corps University Archives in Quantica, Virginia. Her daughter, Mary Breckinridge, started the Frontier Nursing Service in Kentucky and her papers including personal letters to her mother are at the University of Kentucky in Lexington. Then there are the Carson Family Papers at the Filson (also in Kentucky). Her brother William Waller Carson was an engineering professor at University of Tennessee and his papers are in Knoxville. Maybe the other side of the story is in these places. Maybe not. Despite the years of research and volumes of information I have collected, I still have more to do. I don’t really know who Katherine Carson Breckinridge was and I may never fully know but I’m sure having fun along the way.